Vince top with tied back hem. A.L.C. "Harris" top with cascading ruffle trim at shoulders. Crew neckline; button-keyhole back. Flutter cap sleeves. Relaxed silhouette. Straight hem. A.L.C. "Harris" top with cascading ruffle trim at shoulders. Crew neckline; button-keyhole back. Flutter cap sleeves. Relaxed silhouette. Straight hem. Pullover style. Polyester/spandex. Imported. Model's measurements: Height 5'10"/177cm, bust 31"/79cm, waist 24"/61cm, hips 34"/86cm, dress size US 0/2. Cushnie Et Ochs "Arizona" top with wraparound zipper. Crew neckline. Long sleeves. Slim fit. Cropped hem. Pullover style. Polyester/spandex. Made in USA of imported material. Model's measurements: Height 5'10"/177cm, bust 31"/79cm, waist 24"/61cm, hips 34"/86cm, dress size US 2. 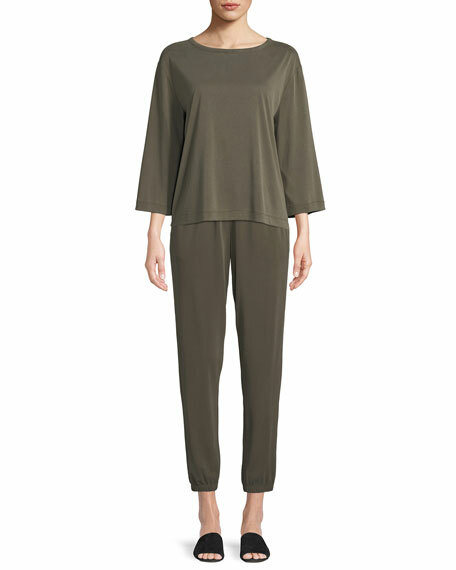 Gabriela Hearst "Bravo" knit top. Crew neckline. Short sleeves. Slim fit. Pullover style. Cashmere/silk. Imported. Model's measurements: Height 5'10"/177cm, bust 32"/81cm, waist 24"/61cm, hips 35"88cm, dress size US 2/4. Lela Rose top in stretch-wool. Crew neckline. Long sleeves; tie cuffs. Hidden back zip. Boxy fit. Wool/nylon/spandex. Made in USA of Italian materials. Model's measurements: Height 5'10"/177cm, bust 33"/84cm, waist 25.6"/65.2cm, hips 35.8"/91cm, dress size US 2-4/FR 34-36.